The third week of Bricktober has the four-pack everyone has been waiting for - the free LEGO Marvel Super Heroes Minifigure Collection (5005256) containing War Machine, Wong, Tony Stark with the Mark 50 arc reactor, and White Wolf/Bucky. 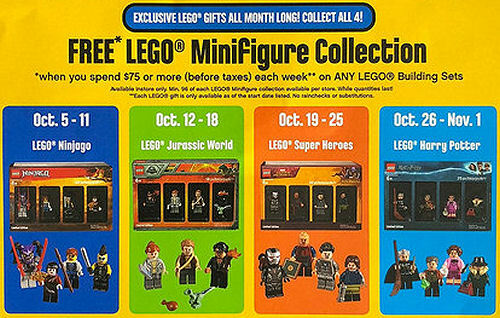 This promotional set is free when you make an in-store $75 pretax purchase on any LEGO sets between October 19th and 25th. Online purchases do not qualify. Bricktober continues through - you guessed it - October with the following Gift With Purchase (GWP) promotions, as well as a Make & Take to closeout the promotional calendar.